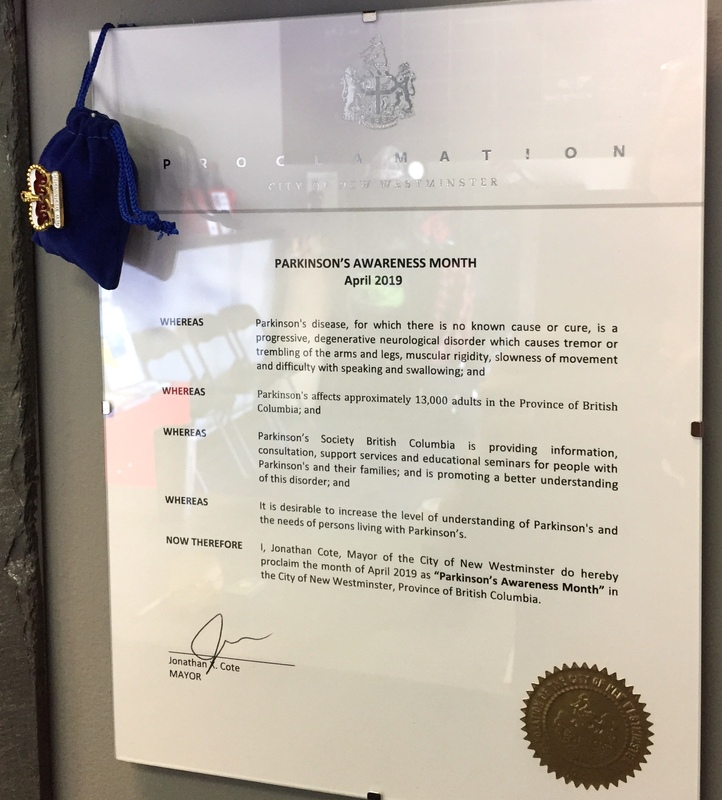 The City of New Westminster has proclaimed April as Parkinson’s Awareness Month and the new Parkinson’s wellness centre in Sapperton has some special announcements, workshops and events planned. Starting with a new name, IMPACT Parkinson’s, and website launching on World Parkinson’s Day, April 11 plus receiving their Incorporated Non-Profit Society status. I’ve never joined a program specifically for people with Parkinson's before. I participated in the yoga class and have now signed up for more. Our guide, Kelly, creates a safe and supportive atmosphere. I swear I can feel my ‘noisy’ body become quiet after a session. Recommend it! Namaste! We have read a lot about Parkinson’s and exercise of some sort is encouraged by most of the sources we have found so I have taken that to heart. 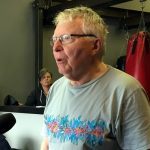 I exercise five times a week which includes two days with Rock Steady Boxing New West at IMPACT Parkinson's. Also, I recently bought a set of walking poles, another way to exercise while enjoying the fresh air. Boxing helps me to maintain my balance and will help me to become stronger and more flexible. It is a great workout with caring, empathetic and knowledgeable leaders - but they don’t let us slack off, it is a workout after all! I also enjoy the company of the other fighters, we all have the same issues but their encouragement and camaraderie helps a lot. I have also participated and benefited in other programs at IMPACT such as Yoga and the Chronic Conditions Self Management Program. 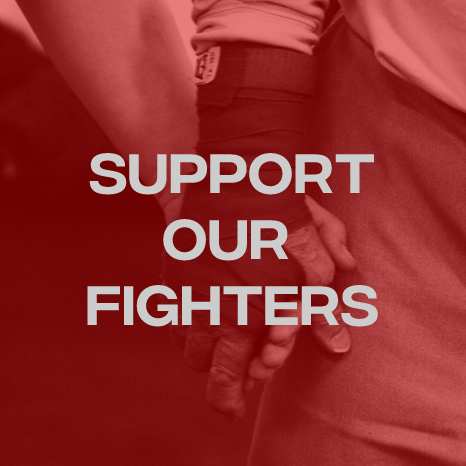 IMPACT Parkinson’s calls us fighters, not boxers. It would be so easy to stay home and think about this illness and do nothing, but with the love and help of our families, and the encouragement of others with PD we can push back and continue to enjoy ourselves and lead full lives. Keep Fighting! Tim and I would like to thank you very much for including us in the Parkinson's Falls Prevention clinic. The information we got from the home safety forms with suggestions for further safety will be very useful. The assessments at the three stations were very thoroughly and respectfully conducted and we learned a lot for going forward with Tim’s safety. Thank you so much for the concern you showed us. 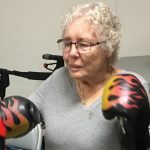 I was introduced to Rock Steady Boxing in Arizona at a voice therapy group. 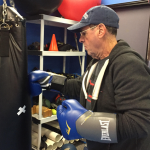 When I returned to BC, I went to see the facility at IMPACT Parkinson's and discovered that in addition to boxing there were many other programs available from speech therapy to lawn bowling outings! Having now sold my home in AZ I expect this facility will become more important in slowing the progression of my PD and symptoms. They have a great group of staff and volunteers that really care. My husband and I participated in the Let's Talk Loud program at IMPACT. It was extremely helpful for me. I was reminded of the importance of speaking up: I just had to be aware. It was very useful to have lessons twice a week. Working with the others in the group created a real bond among us. I found it extremely rewarding. Robyn is the most supportive and caring trainer I've ever met! I'm fully benefiting from her fun and creative classes and always look forward to the next session. Her dedication and real concern for our wellbeing is impressive! I love all the programs at IMPACT! The programs have all been worth it - Urban Poling,Chronic Conditions Self-Management Program, Falls Prevention Workshop and Clinic,Yoga, T'ai Chi and Rock Steady Boxing. I've never felt pushed. Always giving it my all. I’ve met some awesome people. I love getting emails from Heidi. You never know what’s next! I’m in the Monday/Wednesday Rock Steady Boxing classes and I am keenly aware how much better I feel Monday to Thursday vs over the weekend. I couldn’t live without my Rock Steady boxing group!!!! I was diagnosed 10 years ago. I have been attending Rock Steady Boxing since Robyn started this program three years ago. It has helped me in keeping a positive attitude, good physical strength and balance. Robyn and her volunteers always make the classes fun to attend and, offer all of us, a lot of encouragement. This program also helps us to interact with many other people with Parkinson’s, so we can learn from each other, and create a support system. I think that this is a great program. Go Fighters!!! There is a life after Parkinson's and Robyn and Heidi helped me discover that. 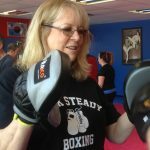 Rock Steady Boxing has helped me in every way to deal with a difficult diagnosis. Physically I am stronger. My balance and coordination have improved. I have developed a support network that has supported me emotionally. 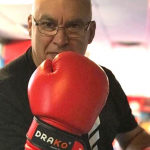 My neurologist is impressed with my progress and I contribute much of that to the individualized, self paced, respectful boxing program that Robyn offers.  IMPACT offers a number of programs designed to support individuals living with Parkinson’s and I highly recommend them. To not participate in physical activity is to give into the disease and that is just wrong! We recently participated in the group voice therapy at IMPACT called Let's Talk Loud workshop. It was so informative. Mia who taught the class brought up things that hindered speech that I had never thought of before. I highly recommend caregivers taking it as well the PWP. Speech is so complex. I would recommend that people take this course before speech becomes a big problem…it is easier to work on it at that level. As a caregiver I now have a better idea how to help my husband. I think that it is altogether too easy for a person with Parkinson’s to lapse into a sedentary life style. In my case ,I was becoming addicted to movies. The only exercise that concerned me was getting out of my chair for meals or other biological needs. 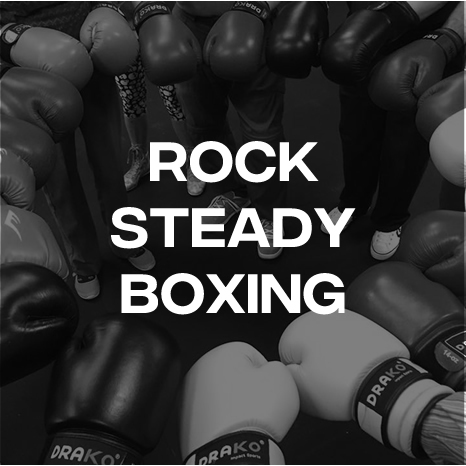 The family doctor suggested that I give something called “Rock Steady Boxing" for people with Parkinson’s a try. I was a little apprehensive at first. After all, the situation in my mind was “Me! : Boxing? 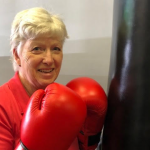 !” Robyn Murrell, the person behind the Boxing program and Head Coach, quickly set me at ease and convinced me to give it a try. As it turned out, the boxing sessions consist of boxing techniques and exercises aimed at increasing strength, dexterity and balance. All this under the watchful eye of Robyn and an amazing group of very helpful volunteers. For me, one of the distinct plus's with this program is not having to be embarrassed in any way when the Parkinson’s symptoms show up. We all shake and stumble. We’re all in the same boat. One last comment re: Rock Steady Boxing.....IT’S FUN!!!!! First time I tried Rock Steady Boxing with Robyn I was hooked! It has been nothing short of fantastic, improving my quality of life a ton. I'm healthier than I was ten years ago. Rock Steady has increased my mobility, my fitness, my cognitive thinking, my strength, my balance, flexibility and focus. I can't recommend the program any stronger. It is so much fun. I can't imagine a time when I won't be doing it. The people I've met are all top drawer too. I'm also thrilled that my wife Cathy is a volunteer in class! I can’t say enough good things about Robyn and the IMPACT Parkinson’s Team. 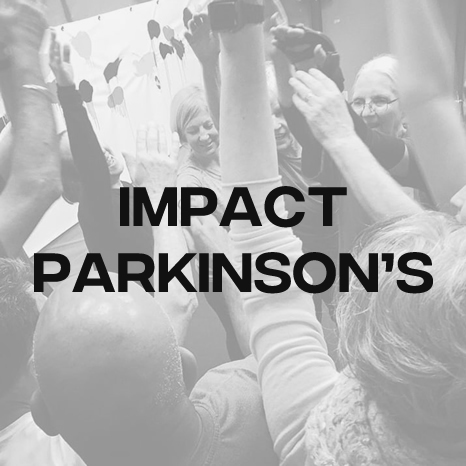 To say IMPACT Parkinson’s cares about its program users would be a huge understatement. They have truly created a loving, caring, supportive program environment. Such as their Rock Steady Boxing program that provides not only physical work out components matched to the individuals’ capabilities and needs, but also focuses on other PD challenges like dexterity and voice fluctuation. It’s also a great environment to bond with other PD individuals who share similar symptoms and understand what your daily challenges look like. I highly recommend IMPACT Parkinson's for all the “ the movers and the shakers” in our Parkinson’s world. 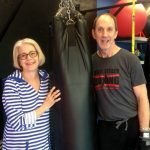 I started volunteering with Rock Steady Boxing New West in January 2019 shortly after my wife’s Parkinson's diagnosis was confirmed. Originally I only wanted to support her, and that remains my primary concern, but it is now more than that. I have no previous experience with Parkinson’s or helping in a gym setting. I am learning something new every week being a volunteer in classes and I like to think I am being useful to the leaders and the fighters. More than anything, we meet great people and we have a lot of fun! I remember it vividly five years ago - the neurologist saying, “It is Parkinson’s - but you won’t die from it”. After that, lots of tears and the “why me” question. I was looking for answers and found support from Parkinson’s Society BC. Through PSBC I found Robyn, the second person with the same attributes of understanding and kindness. She is our ROCK - she guides, challenges and makes us feel “normal” again. She puts her heart into this cause and we appreciate her. 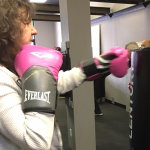 It will be three years now and I would not want to miss classes at IMPACT Parkinson's, especially the boxing, for anything! Thank you Robyn! I have just completed a Let's Talk Loud session at IMPACT Parkinson's with Mia, Speech Language Pathologist. The group voice therapy is designed to allow us to speak LOUD. Mia is an amazing therapist -- she has the ideal balance of professionalism and being social. I was reticent at first to "AHHHH" at my strongest level, but Mia's way of presenting knowledge with humour made me "AHHHH" happily in no time! IMPACT Parkinson’s is an Incorporated Non-Profit Society. It was created to make an IMPACT on the quality of life for people living with Parkinson’s, and their families and friends, by offering programs that focus on mind, body + soul. © 2019 Impact Parkinson’s Wellness Centre. All Rights Reserved.